$10.00 from the sale of each of these calendars goes to Helping Hearts Equine Rescue's SIMON'S LEGACY fund. LIMITED TIME OFFER. He was a used up and thrown away working draft. He arrived the Monday before Thanksgiving in Nov. 2008 from New Holland. It was HHER’s first year. He was a sad and depressed horse who over time found his smile, and developed an incredible personality that he shared with those around him. Night mushies and Stud Muffins were a daily ritual that never failed to brighten my day. He found a place in my heart where he remains, even after his passing June 24, 2013. Since his passing, I’ve wanted to honor Simon by helping other senior work-drafts at the end of their “useful” lives. Those poor old, used-up work-drafts who head to slaughter or some other heinous fate after a life of servitude. We want them to experience peace, contentment and hopefully happiness in their golden years, as Simon did. Hence, Simon’s Legacy. Donations earmarked for Simon’s Legacy will be used to obtain/purchase/pull what would otherwise be “end-of-life/career” senior drafts/work-horses and bring them to Helping Hearts. Funds will also be used for month-to-month care, for veterinary and special needs to give them a comfortable and dignified life without pain or suffering. And yes, lastly, the final gift – if and when physical and medical circumstances no longer allow that comfortable life, to let them go gently and kindly with a veterinary-assisted euthanasia. Calendar includes a coupon code for $14.95 OFF your next order of $40 or more (must be placed in 2017). That makes this calendar COMPLETELY FREE! Each month is a favorite horsey quote, combined with colorful artwork. 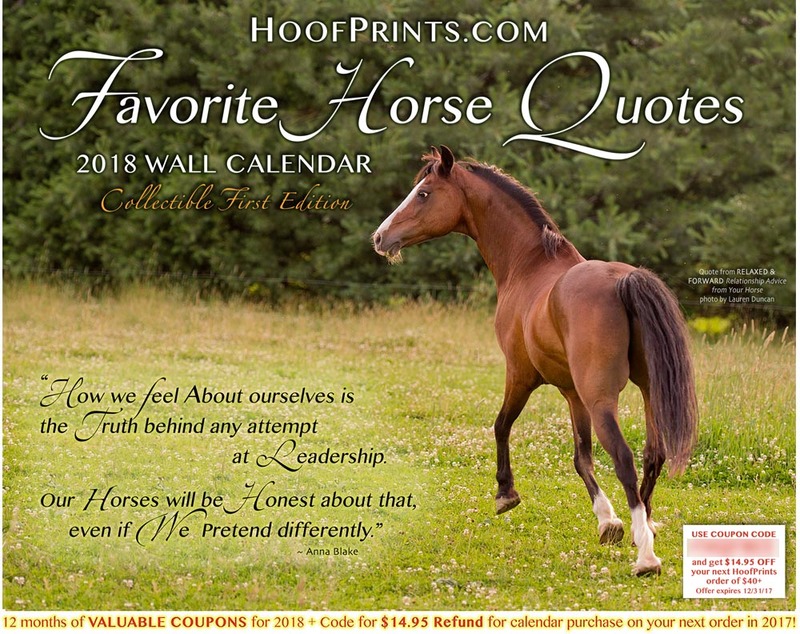 You'll also see related products from the HoofPrints.com store, AND a valuable coupon to be used EACH MONTH on your orders placed in 2018.